The office is moving. After 20+ years in one building, we're moving north to better quarters. This will happen the first weekend in December but we have dates on the calendar to come into the office to pack and, more importantly, pitch. So much junk that is worthless. It will be a 30 minute drive, instead of a 10 minute drive. There is a huge road construction project just south of the new place. Ironically, we've done some work on that project. It's not slated to be completed for another year. I'm sure, eventually, I'll figure out back roads which may cut the commute time for me. I wasn't too happy about moving. I've rather grown fond of being a hop, skip and jump from the office, but, after driving the route a couple times, it's not bad. Winter will be a bugger, but it can be a bugger already when we get a dusting of snow. I'm getting a new office. This is bigger than my current office. We've been told we can paint our offices any color we like. To the left of this space is the front entry. I will have, in the left wall, a sliding window where I can see who comes in. There will be a ledge below that window for the mail, both incoming and outgoing. At the bottom of the space are floor to ceiling windows. They face east. I will have a lot of natural light coming in, which is nice. I'm thinking of getting at least one plant to put on a pedestal in either the northeast or southeast corner, by the windows. I have an aloe vera plant my sister gave me but it doesn't do well in direct sunlight, although, it could do better when the only light is from the east. Something to consider. What to paint the office. My desk is 5 feet long by 28 inches wide. I'm not sure where to put it in this space. Do I put it so I look at the door coming into my office? I like the idea of being able to look out my large windows, but that puts my back to the door. 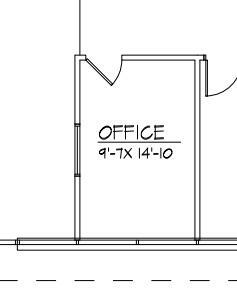 I could put it perpendicular to the big windows facing the small window, with my back to the right wall. We're getting an official coat closet so we no long have our coats hanging over something in our offices. At first, I was thinking of painting one wall blue with the other walls a dove gray. Or dove gray above and blue below a chair rail set up. As you all know, I love color, so the opportunity to put color on my office walls is exciting. Right now, I look at a dirty white with a very ugly light gray green trim. We weren't allowed to change the color of the office when we expanded across the hall from our original place. I happened to think about this as I came in this morning, how this ugly green we're saddled with will be gone. At the office barbecue, we were joking around about office colors. We have a Green Bay Packers fan, a Detroit Red Wings/Lions fan, a Chicago White Sox/Blackhawks fan and a Buffalo Sabers fan. We were laughing about painting our offices in team colors. 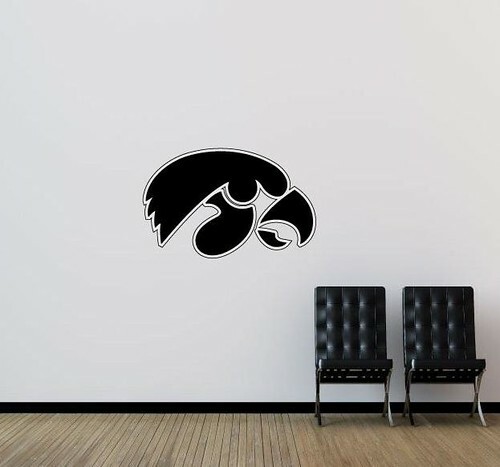 Someone said, "Deb, you need to paint your office black and put yellow hawks on the wall." Well, I vetoed the all black scheme, but the idea of painting one wall, the one on the right, all black and putting a giant yellow tiger hawk on it was very appealing. But the more I thought about it, the more I felt a black wall might get too warm in the summer. Then I hit on another idea. This is a wall decal. It's on a white wall, I believe. What I want to do is put it on a heather gray, like some of the tee shirts I've seen. I'd want it to face the door. I am not sure this decal is big enough for the space, but what I'm going to do is make this photo into a slide, load it up into our power point projector and project it onto the wall right across from the sliding window. Then, I can get it the size I want. I'll trace around it and I can buy the black paint to do the design. The gray will be the unifying tone. To add color, I have some framed certificates and a couple of posters. I have enough room, I could have a chair. The wall to my right in my current office, is festooned with stickers and notes with phone numbers. I have a small cork board in this current office. I just need to consolidate all the bits and they can go onto the cork board. I always get a calendar and I have a clock from home I will bring. I will need to get a shelf or a couple of shelves for my personal photos which currently sit on the sill in the window. I'm not sure if the bookcases I have will stay or will go into the filing room. A great deal that is currently scattered across two office spaces will now be consolidated. So, what do you think? The more I consider this, the more excited I get to do it. Sounds good! if you have eastern exposure be careful about setting up your desk so that your computer monitors get direct sunlight in the morning -- that would be annoying. I have an eastern facing window and have my desk facing north in my office to avoid that, plus I can see out my window and see my door. Nice space and colour choices. Amused myself and sent you an e-mail showing your office with furniture in it.